In a ground-breaking newspaper editorial, the Qatar Peninsula is pointing to a giant elephant in the room – despite the high praise for its flagship Al-Jazeera news outlet, the local press in Doha doesn’t do a very good job. In the masthead editorial entitled “A crippled fourth estate,” the paper writes that the timid local press results from a combination of weak legal protections for journalists, self-censorship from top editors who favor job security over good journalism, and the media’s tangled web of loyalties to big businesses and the government. Such a description could equally apply to most press outlets in the GCC. … Journalists who would like to see an improvement in the situation blame the present malaise largely on the absence of a media law in Qatar. Reporters are viewed as an easy prey by those who disapprove of or are offended by their writings. In countries which have media freedom and extensive laws to protect the media, defamation suits are filed against reporters and their newspapers directly by those aggrieved. In Qatar, however, the situation is different in the absence of a media law. Here, anybody can simply file a complaint with the police against a reporter and his newspaper. The police then call the reporter and question him in a harassing way, and if they (the police) feel there is merit in the complaint, the journalist is referred to the Public Prosecution for further questioning. Since it is the prosecution’s prerogative to refer a matter to court, many complaints against journalists do not reach the court at all and end up in journalists being harassed and humiliated rather than being put on a fair trial. Many a time prosecution officials call a journalist concerned at 5am, when he is in the middle of sleep. The entire process is so harrowing and humiliating for a journalist that he chickens out when it comes to writing critically on issues. Since most journalists in Qatar are foreigners, they obviously want to stay clear of trouble, say media sources. “No one would, obviously, want to be treated like a criminal for writing critically,” says a journalist who was once called by the police for questioning in a defamation-related complaint. And even if a journalist shows guts and is willing to do critical or informative writing, he has no access to officials to get basic information. This is the reason media circles say they are desperate to see an extensive media law being put in place so that the vested interests are not able to harass journalists through the police. … Newspapers are at best a business in Qatar with their owners eventually looking for profits. The largest circulated newspapers thrive mostly on handouts and press releases, which are either in praise of a person or institution or other entity or sales promotions. Critical writing is missing from the newspapers partly because there is no will on the part of the journalists to be critical and informative as also due to under-qualified and untrained scribes manning the dailies. The rest of the editorial astutely outlines the causes and conditions of the timid, uncritical press in Doha. The editorial was applauded beyond Qatar’s borders — particularly in the United Arab Emirates. Two Emirati commentators quickly praised it. Prominent commentator Sultan al Qassemi, who recently gained international recognition for his coverage of Arab uprisings, tweeted that he couldn’t believe that parts of the editorial were published. “This may be the dawn of a new era for Qatari and Gulf journalism,” he said. Al Qassemi made many of the same points about the Arab press – particularly the news outlets in the UAE – at a business entrepreneurship conference last year. “Probably the most self-critical piece of a GCC state by a local paper,” he tweeted. Still, the move by The Peninsula should be praised. Hopefully, it will be followed by action — both from local media outlets and the government – to produce a more critical press that better addresses the concerns of its citizens. And, perhaps such an approach will spread throughout the GCC. Only then will the editorial represent a “new dawn” for Gulf journalism. 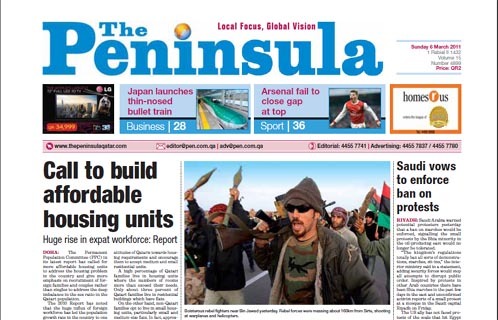 The issues raised in The Peninsula piece apply equally to the UAE with its much deeper media sector. It remains all to easy to enmesh a journalist for criminal libel with potentially devastating consequences Sadly no comments from ‘UAE commentators’ on that!